Champion of the mystery section in a Minnesota library, Karen Nash is embarking on a dream trip to London. But she’s clueless why the love of her mid-life, Dave, would dump her hours before take-off—until she spies him at the airport with a young honey! She decides the best revenge is to get on that plane anyway . . . and entertain schemes for Dave’s untimely demise. After touching ground in the hallowed homeland of Christie, Sayers, and Peters, she checks into a cozy B and B run by charming bibliophile Caldwell Perkins. Soon she’s spilling tears in her pint at the corner pub, sharing her heartbreak saga with a stranger. That night, a B and B guest drops out of circulation—permanently. Then Karen realizes Dave and his cutie are an assassin’s target. With the meticulous attention to detail that makes her a killer librarian, Karen sleuths her way through her own real-life mystery—in which library science meets the art of murder. 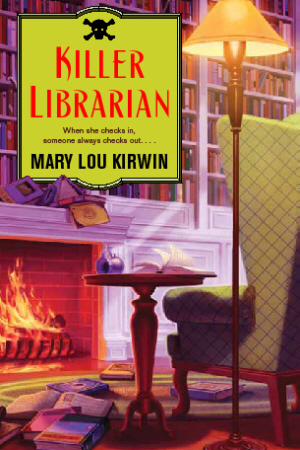 Mary Lou Kirwin’s second novel featuring Karen Nash, killer librarian, is coming in 2013!